Northward view of rural Interstate 65 from the U.S. 24 & 231 overpass outside Remington in southern Jasper County. Photo taken November 5, 2009. 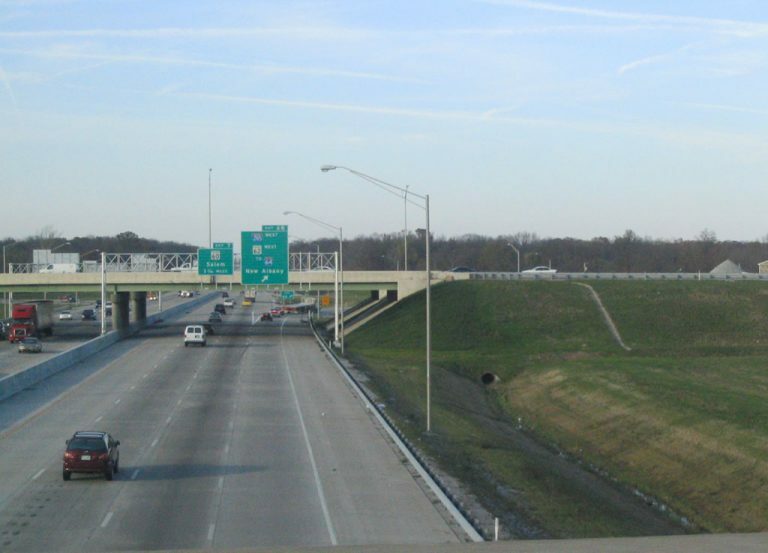 Interstate 65 is currently the longest interstate in Indiana (at 257 miles) and also its most important, connecting the Louisville Metropolitan region with the Greater Chicago Metropolitan region to Indianapolis, the largest city and capital of the state. The highway was built from the early 1960s into the 1970s when the combined section with Interstate 70 in Downtown Indianapolis was finished. From Louisville to Indianapolis, the highway replaced U.S. 31, to the north toward Chicago; it replaced U.S. 52 and parts of U.S. 41 as the primary Indianapolis-Chicago route. The first 10 miles of Interstate 65 are in the Southern Indiana suburbs of Jeffersonville and Clarksville, across the Ohio River from Downtown Louisville. North of Sellersburg, the highway heads north through rolling hills past Scottsburg, Seymour and Columbus. North of there it enters the till plain of Central Indiana as it passes by Franklin and Greenwood before crossing the urban center of Indianapolis, where the heaviest traffic along the interstate is. 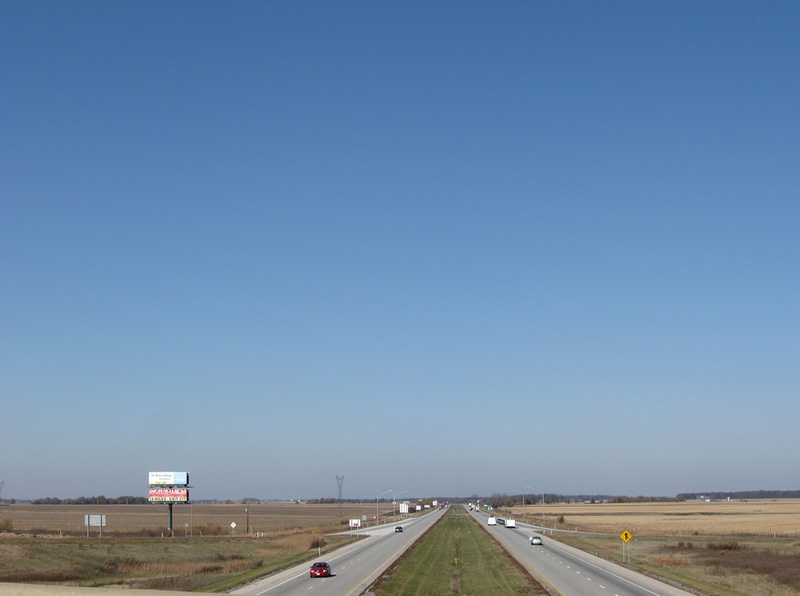 North of Indy, the highway returns to the rural plains of the state as it goes by Lebanon, Lafayette, and Renssellaer before ending in the Northwest Indiana suburbs at the Indiana Toll Road. Construction began in July 2013 on a new northbound span for Interstate 65 across the Ohio River. The new cable-stayed bridge opened to northbound traffic on December 6, 2015. Southbound I-65 moved onto the bridge on December 16, 2015 while the adjacent Kennedy Bridge undergoes rehabilitation to late summer 2016. 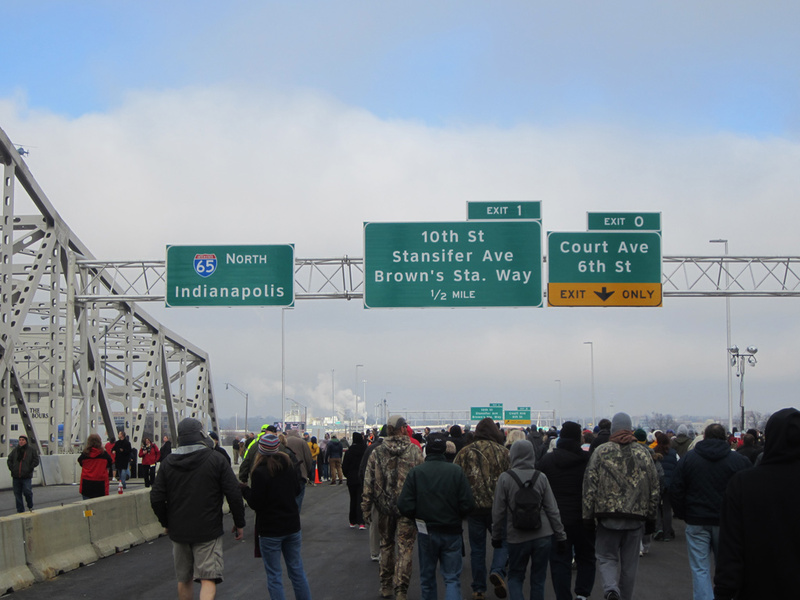 Crossing into Indiana along the Abraham Lincoln Bridge during the public bridge walk held on December 5, 2015. Photo taken by Tom Reaugh. Welcome to Indiana sign posted as Interstate 65 north departs the Abraham Lincoln Bridge over Court Avenue in Jeffersonville. Photo taken by Tom Reaugh (12/05/15). Passing over Interstate 65 at the eastern terminus of Interstate 265 in Clarksville. Photo taken by Carter Buchanan (11/12/04). SR 60 meets Interstate 65 (Exit 7) at a diamond interchange just west of its terminus at U.S. 31. SR 60 was realigned with construction of the freeway, with Old SR 60 leading south nearby to end at U.S. 31 and Hamburg Pike. Photo taken 11/07/11. Heading north along Indiana 11 to the north of Seymour in northern Jackson County as the highway approaches the interchange with Interstate 65. Photo taken 06/06/12. Northbound on U.S. 31 in Taylorsville in northern Bartholomew County approaching the interchange with Interstate 65. Indianapolis and Louisville are the control cities along I-65 in southern Indiana, following the path of U.S. 31 in between the two cities. Photo taken 06/06/12. A close-up of a state-named Interstate 65 shield at the intersection of Raymond and Shelby Streets on the Near Southside of Indianapolis, just west of the interchange with Raymond Street and I-65. Photo taken 03/11/12. U.S. 6 Business (East 37th Avenue) east at the folded diamond interchange (Exit 258) with Interstate 65 in Hobart. I-65's northbound ramp is signed to Chicago for the connections with Interstate 90 west. Photo taken 09/03/05. Interstate 65 continues just three more miles to end at U.S. 12 & 20 (East Dunes Highway) in Gary. Photo taken 09/03/05. Oak Street (old Indiana 334) sees a diamond interchange with Interstate 65, connecting the freeway with Whitestown, Zionsville and the Anson development to the east. Pictured here is a span-wire supported shield for the southbound on-ramp to Indianapolis. Photo taken 11/05/09. Interstate 65 & U.S. 52 south split at the next interchange (I-865) south of Oak Street (former SR 334). Photo taken 11/05/09. A westbound reassurance shield that was posted for Indiana 334 between Interstate 65 & U.S. 52 and Indianapolis Road (old U.S. 52) near Royalton. The state road traveled east 6.3 miles to U.S. 421 and Zionsville until its decommissioning in summer 2011. Photo taken 11/05/09. Approaching a diamond interchange between Indiana 2 (181st Street) west and Interstate 65 at the settlement of Dinwiddie. Photo taken 11/05/09. Interstate 65 travels north 22 miles from Indiana 2 (181st Street) to end at Interstate 90 in Gary and south 126 miles to Indianapolis. Photo taken 11/05/09. Indiana 2 reassurance marker posted after the interchange with Interstate 65 at Dinwiddie. A pair of truck stops and other traveler services follow for I-65 motorists at Exit 240. Photo taken 11/05/09. 109th Street westbound at the 2010-completed diamond interchange (Exit 249) with Interstate 65 at Crown Point. Photo taken 05/14/12. U.S. 6 Business (West 37th Avenue) meets Interstate 65 at a folded diamond interchange (Exit 258) in the city of Hobart. The Business route follows old U.S. 6 (Ridge Road) from U.S. 41 in Hammond east to Highland, Griffith, Gary, and New Chicago while U.S. 6 follows Interstates 80 & 94 east from the state line to Lake Station, using Ripley Street south with Indiana 51. The loop is poorly signed in Lake County. Photo taken 09/02/05. A parclo interchange joins East 15th Avenue with Interstate 65 just south of the freeway's end at U.S. 12 & 20 (Dunes Highway). The northbound loop ramp is simply signed for the connection to the Indiana Toll Road, though access is provided to Dunes Highway as well. Photo taken 11/05/09. Interstate 90 trailblazer posted at the I-65 northbound on-ramp from East 15th Avenue. 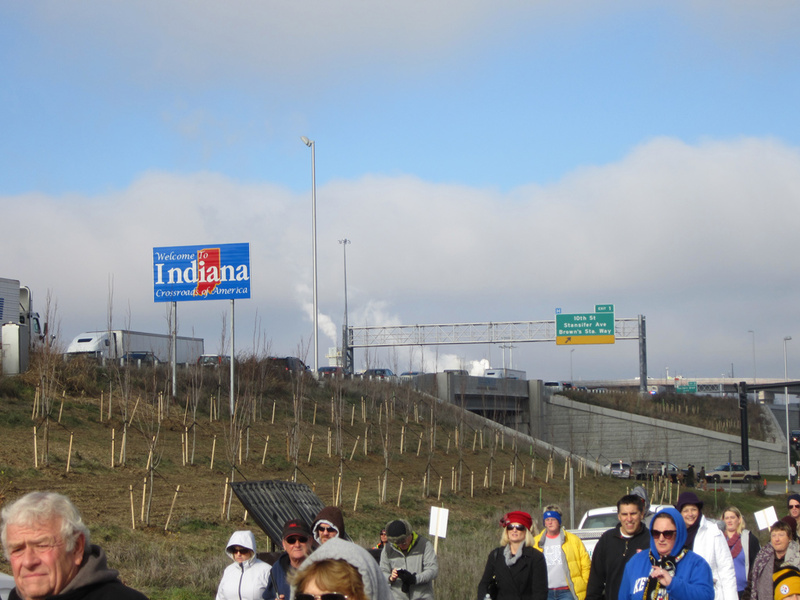 A sign bridge to the left represents the path of the adjacent Indiana Toll Road. Photo taken 11/05/09.